Our expert services include the design,manufacture and installation of stainless steel and aluminium balustrades , glass and wood for balconies , staircases , spiral staircases andhand rails that will uplift the look of any home or building. 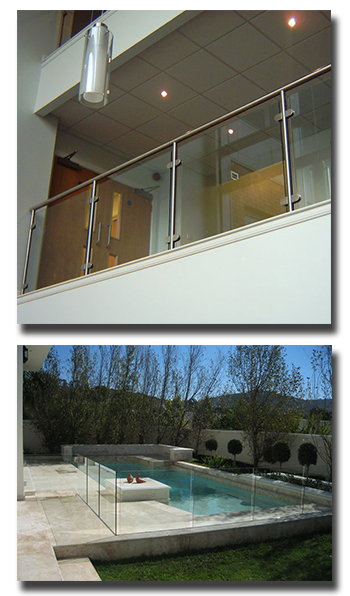 Our frameless glass balustrades with which to enclose your balcony, patio, pool or staircase is aesthetically pleasing and safe to use. We manufacture stainless steel balustrades and staircases for the commercial industry that suit all architectural designs. Our quality and workmanship is guaranteed and our involvement in the commercial industry is built on a solid reputation. Mild Steel options with durable coatings for added corrosion resistance are also available. The grade of stainless steel has a major influence on its performance and at Duratrendonly the best grade stainless steel is used and matched against the environment for suitability. Highly-fire resistant, stainless steel is the ultimate safe material to use when adding finishes to a home, building or office.